The APX Transportable Base Station is a rugged yet lightweight rapid deployment product that you can rely on during covert operations and emergency response situations. Ideal for agencies who utilize rental cars, this aluminum lockable suitcase is ideal for “jump and run” scenarios when immediate and clear communications are a necessity. 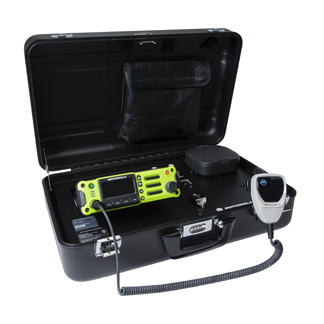 Its compatibility with the APX7500/6500/4500 mobiles always ensures the most secure and reliable communications. The “mouse-hole” exit for a power cable allows for covert closed case operations. Engineered with top panel quick connections for efficiency, the APX Transportable Base Station is the ideal solution for federal agencies and first responders on the move. © 2017 Midwest Mobile Radio. All Rights Reserved.